Summer School Can Be Cool! Summer is now here and I am just got done with school... now it's time for Summer School Community Connections. This means I get the kids after they are in the morning session and now it is the afternoon. For me my Community Connection is STEM garden club. In the past I have taught strictly Garden Club, but after seeing their exhausted faces after not only going to school 9 months out of the year with such rigor, I could not put them through any more let's learn a ton from a book or go outside for an hour and connect to nature. That is when I see discipline issues...when they just can't take anymore learning. Let's just say this Monday, I was a little nervous because I saw these kids goofing around and not focus in the gym as I went to get them. It was kind of scary they weren't my students from my school...they were at MY school...and they were not having any of the I am going to be a listener thing! These kiddos are not used to STEM activities so the test was going to be whether or not they could handle calming down and focusing and using their brain to build something absolutely amazing...absolutely summer centered... and garden connected! Did I achieve my goal? Yes I did! I went through our rules and expectations of our school and then I told him how we were going to have fun and it wasn't going to be boring because we were going to learn about food chains. I laughed out loud when I saw there faces. Then I added the icing on the cake...We were going to do that through STEM! I explained what each letter stood for and their ears perked up. I had them! All right so maybe food chain sounds a little boring but when you tell them you're going to be learning about food chains... and then going out in the garden to connect the garden to food chains....and then if all is good... come back inside to build a bird beak that will pick up a food source we can put it all together! So how can you achieve the goal of getting kids excited for summer learning? STEM! Find a really great picture book that'll tie in a concept to what you need to teach. Connected to something they can build or create using materials that are readily available in your classroom. find ways for you to get them actively engaged and talking to each other about what they built and create...what some of the problems were when they were trying to build and engineer...and how they overcome any obstacles that might cause them to get upset and want to give up. You also want to focus on the problem solving that is involved as well as any solutions that they came up with in a positive way to keep on going. That's an easy way for you to tie and positive growth mindset to your lesson as well! What have I been using for my weekly lessons? I have been creating some great NGSS STEM Quick Picks. Each pack consists of a reading and assessment component for data collection, a science component, a STEM connection, writing activities, and a ticket out the door! Each week I will be adding a new pack because...guess what??? I need them for my lessons! 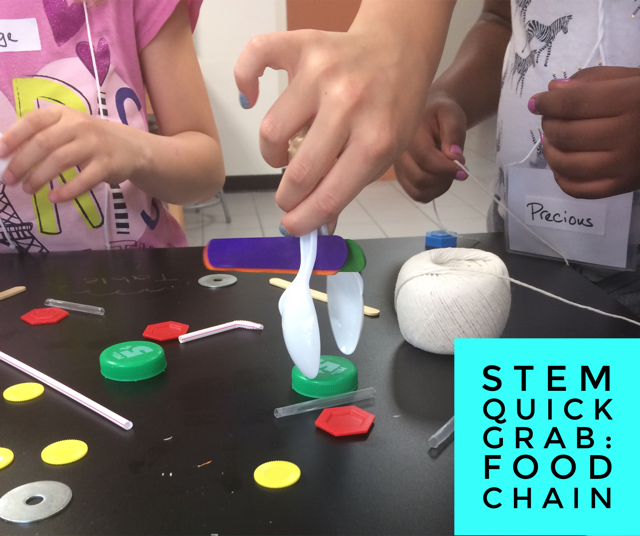 This week's STEM Quick Pick is based on Food Chains! 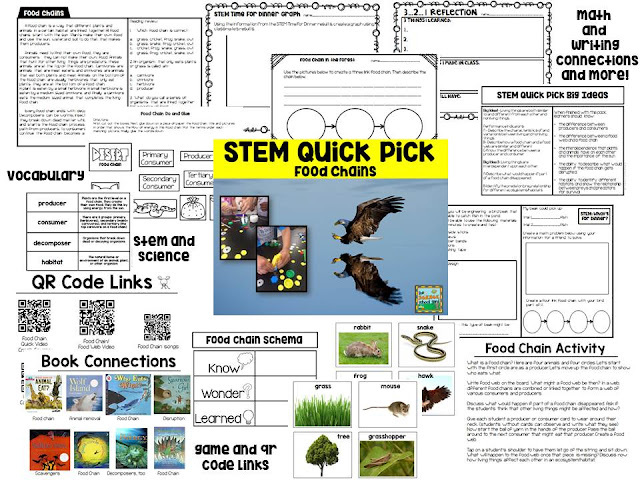 Find Your Food Chain STEM/NGSS Science Quick Pick HERE!